This is my favorite son in law's quilt that I made him for Christmas......well he's my only son in law so far so that would make him my favorite. He had been asking for a quilt for some time ( hard to believe that a man would take an interest in quilting, however he did). 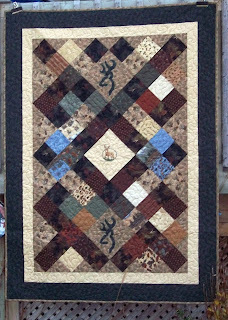 He did have stipulations though, one being that it had to be a hunting quilt and it had to have the "Browning" hunting logo on it. At first I thought, OMG, why would you want to ruin a perfectly good quilt, but then I tried to think how I could incorporate it to make him happy. I'm pleased with what I came up with. I used a couple of charm packs that I had stashed away, found some co-ordinating stash for the setting triangles and borders and I was well on my way. I embroidered a deer in the centre block to try and tie everything together. I appliqued the logo on two on the blocks in co-ordinating fabric. As a joke I embroidered on the back " if it flies it dies, if it's brown it's down " along with a wild turkey. He just loved it and that made it so worth while! 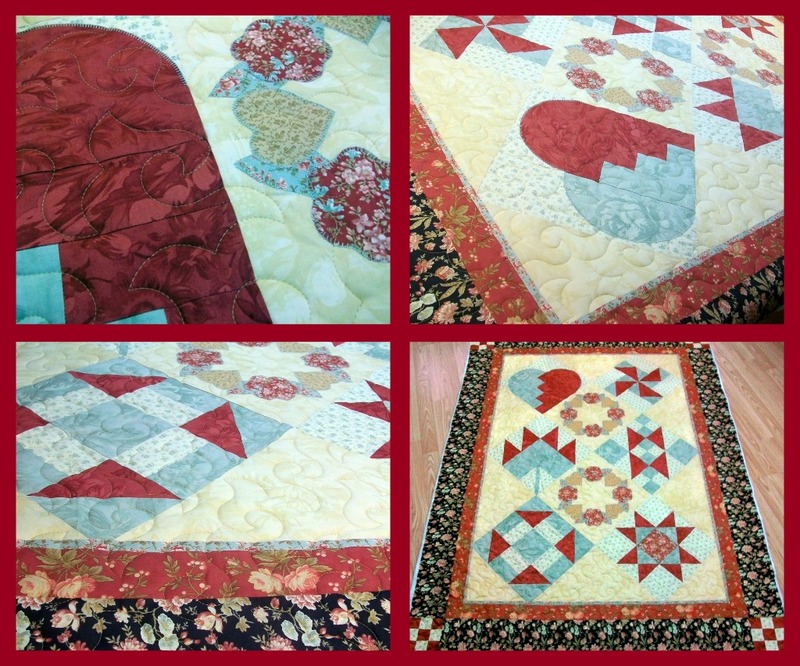 This is Kathie's quilt, a beginner in my "beginner's" class at Kindred Spirits Quilt Co. Hard to believe that she is a beginner. She had sewing knowledge and was a very attentive student and she did amazing, don't you think. The students were just to make a table topper, however Kathie had seen my larger sample, had extra fabric and went for it. I met her husband at the store after it was quilted and he said he was quite proud of her...I guess! 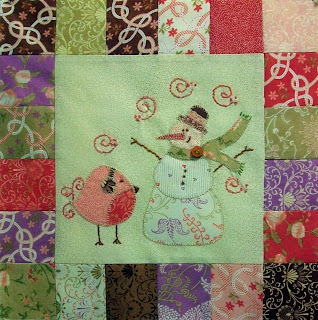 It looked lovely quilted in the pattern Happy Times and Kathie was a joy to teach. I hope I see her at more of my classes. I love this new BOM from Little Miss Shabby. Thank you so much for sharing your creativity with us. I'm hopeless at hand embroidery so I'm going to attempt to applique the blocks and use minimal embroidery. My fabric choice is Gypsy Rose from Fig Tree and I think the first block turned out OK. It should be really sweet when it's all completed. I've done a little embroidery for the details in the background and the bird tail and legs and that was even too much for me. Can't wait to see February's design! I'm so excited to start this new BOM from Little Miss Shabby. It is an embroidery BOM, and since I'm not that great at hand embroidery, I thought I might be able to cheat and applique instead. I'm going to try and see how it turns out. I've been rummaging through my stash instead of buying new fabric.....(I really need to de-stash)...so I came across a jelly roll from Fig Tree called Gypsy Rose and I think it will be perfect. The little birdie is so tweet! Can't wait to see the whole flock finished. I've been designing doll patterns for Kindred Spirits Quilt Co. over the last year to teach at their quarterly doll class. 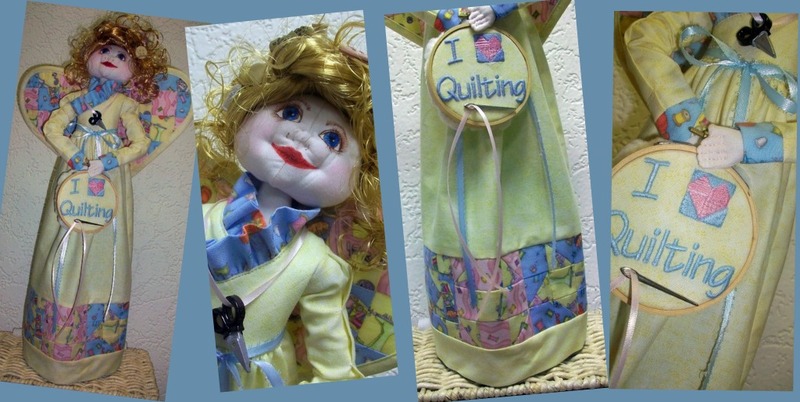 First there was Garden Annie, then Stitch the Witch and lastly Holly the Quilter's Angel. Well, we are into a new quarter and guess what...I need to come up with a doll for the spring class. I thought with spring and Easter coming quickly, a bunny might be a nice option. 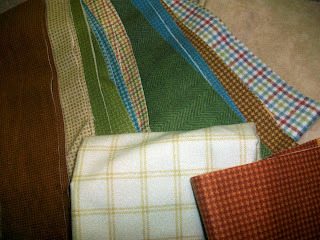 These are the fabrics I've chosen. Michelle has wonderful flannels in the store so what would be nicer than a flannel bunny......He's still a surprise and I'm still finishing off the details and the pattern. As soon as he's complete, he'll hop onto the blog for you to see. I designed a doll for Kindred Spirits Quilt Co. before Christmas called Holly the Christmas Angel. Instead of making the same doll again when I taught the class I thought it might be nice to change her up a bit. I had this cute sewing themed fabric that I got during the summer and thought it would look sweet on her. There are 3 inch quilt blocks around the base of her skirt, 1 inch squared patchwork wings and I added an embroidery hoop with "I love Quilting". Her face is sculpted and painted with permanent marker. She has notions added to her hair and I think she turned out nicely. She stands on a wine bottle so that was a unique twist to a doll pattern. 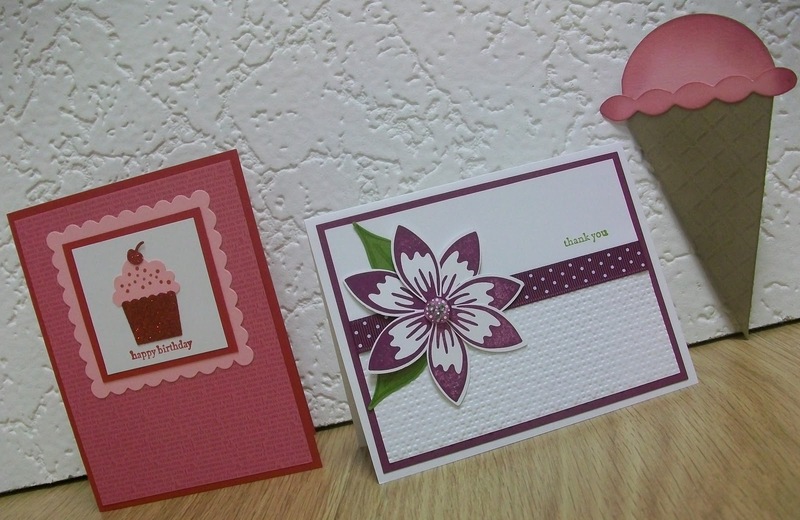 These are the cards I made at my January card class. They are simple but effective and with four kids the stash comes in handy. There is always one of them asking for a card for a friend, or a thank you, or a birthday and I like that they ask and that they are going to good use. These cards are made with Stampin Up materials and tools and our demonstrator Cindy is great. I love going to the class, getting creative and being able to socialize with the other ladies. It's a fun night out. My new subdivision is under construction and I'm really happy with how it's coming along. It's a BOM called House Hunting and I chose to do it in primary colors in juvenile prints. I'm thinking that it will look adorable on a granddaughter's bed(once I get one) ((granddaughter that is)). 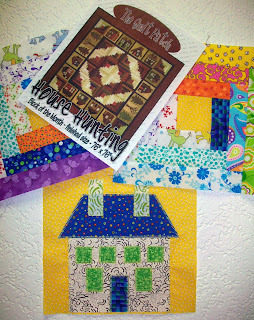 Each month you make a house block and 2 log cabin blocks, add in some trees and sashing and in a year it's complete. I hope mine turns out as nice as my friend Annabelle who inspired me to make one of my own. I've gone a little squirrel-ly with all the BOM's I've taken on this year. I hope I can keep up. There are two from last year that I'm still working on...Tiny Town and Snowbound, then this year I've started on Henrietta Whiskers, Birdie Stitches, Sunbonnet Sue embroidery, and House Hunting. OMG what am I thinking! I love how Henrietta turned out in the Migration fabric and can't wait to see what she's up to next month. Thaw your puff pastry in the fridge then roll out one sheet on parchment paper to measure about 10X12 inches. Sprinkle granulated sugar and cinnamon mixture all over one sheet of parchment paper, then transfer the rolled puff pastry onto it and press the bottom of the puff pastry so that the sugar sticks. Coat the top layer in sugar cinnamon mixture as well and press firmly. Make sure the longer length of the puff pastry is facing you. Gently with a knife, score a line down the centre of the pastry, being careful not to cut right through. Begin to shape the pastry, by rolling each side tightly into the center. Place the parchment and roll onto a cookie sheet and place in the refrigerator for 30 minutes Preheat the oven to 450F. Take the roll out of the fridge and begin to cut approximately ¼ inch slices all the way down the roll. You will need to squeeze the bottom so that it looks like a little heart shape. Place each heart on a baking tray lined with parchment paper. Bake them in the oven for about 10 minutes flipping them over at the 5 minute mark until they are golden brown and caramelized. The Palmiers can be eaten fresh out of the oven or when they have cooled down. They can be stored for a few days in an air tight container (that never happens). These would be great wrapped up for Valentine's Day for someone special. Good luck trying to resist! Linda did it again with this lovely "Chinese Coin" quilt. She made another fabulous quilt. I think she said that she ordered it as a kit from one of the quilt magazines. It turned out lovely and I lave the colors of brown and aqua, they go so well together. She put a really sweet brown with tiny blue dots on the back and we quilted it in the panto "Wandering Daisies". This is block one of a BOM quilt I have decided to do this year. 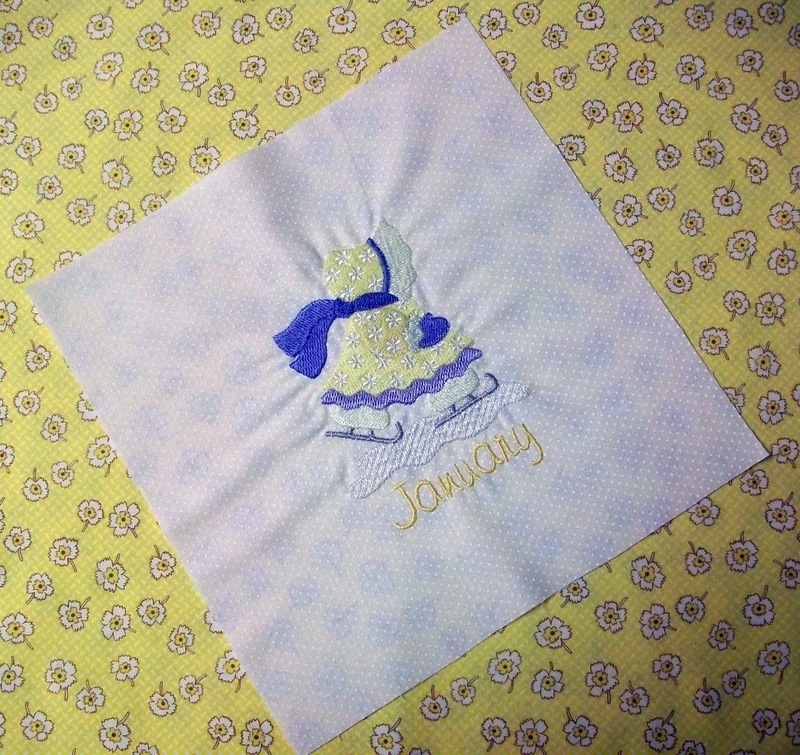 I've had the embroidery design pack for Sunbonnet Sue for a while and I think she is so sweet. I had previously purchased "30's Reproduction Fabric" for the sashing and borders and I'm trying to do the quilt in yellows. 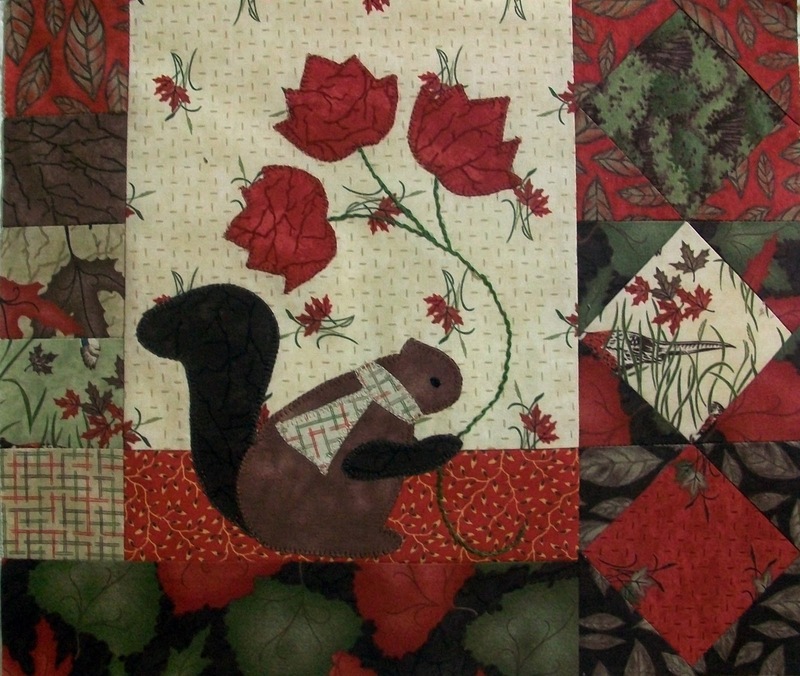 Each embroidery design depicts Susie doing something themed to that particular month. I have a good friend and sister named Sue so maybe that is why I was drawn to this. They will probably both get a kick out of it. Thank you Bunny Hill Designs for this wonderful new BOM. I very much enjoyed Tisket Tasket Baskets (finished) and Snowbound (still working on). Henrietta is lovely and I am so excited to start. Anne, this is so generous of you to share your creativity with us, thank you! I am desperately trying to utilize what fabric I have in my stash since I have no money no retired, and I had originally slated this fabric to make a quilt for my brother in law Spike. When I started to did around in my stash cupboard I realized that "Migration" would be perfect for Henrietta and was a good match as the line is based on nature. I'm so excited, I just need to keep up each month ( that's my new year's resolution). I'm really having trouble getting back into this winter mode. Two weeks in Cayman will do that to you. 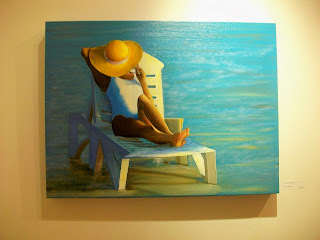 No this is not a portrait of me on the beach in Cayman....I wish! It is an oil painting that my 85 year old mom did though. Isn't it amazing, and so is my mom. She does beautiful work and this is one of my favorite. While we were in Grand Cayman, my uncle who lives there and whom we were visiting, had a showing of his batiks. He is also an amazing artist. My mom, his sister, showed some of her work at the same art show and this was one of hers. It's titled " Just Veggin". Makes me wish I was back lazing on the beach. I need to get a grip, and get back in the groove with the snow and sub zero temps, if I'm ever gonna make it til spring. Ok, I'm back..... relaxed, rejuvenated, refreshed , readjusted and ready to go. Believe it or not this is the picture I took from my lounge chair while laying on my back trying to get some well needed R&R. 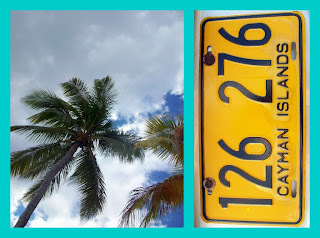 Cayman was amazing, the weather beautiful, the beaches gorgeous and the time there needed. I went for two weeks and spent some time with my mom, sister, brother and daughter. My uncle lives there, has a place right on the beach and welcomes the company. Dear hubby stayed home and held the fort. We have 2 boys still at home and while they are "good" boys, one is still a teenager and they have been known to party. Dear hubby was just making sure that there were no open beer bottles other than his own. It is good to be back, and I'm looking forward to a new year of creating, quilting, crafting and just having 365 days of wonderful!